London venue The Mermaid has launched independent corporate events space, the River Rooms. 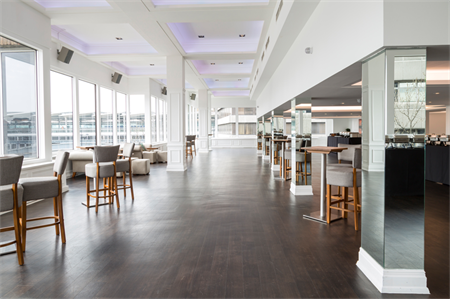 The River Rooms is a versatile blank canvas space that sits alongside conference and events centre, The Mermaid, which is situated by Blackfriars Bridge in the centre of the City of London. The events space is set up in a minimalist way and offers panoramic views across the Thames to the Southbank. It is split into with three different rooms, across two floors, allowing the space to be tailored to suit every style or theme of corporate event, including dinners and awards. The rooms can host up to 1,000 delegates in total, with 500 in the Upper River Room, 300 in the Lower River Room, and 200 in the Queenhithe room. "The River Rooms are a contemporary, multi-purpose space with the ability to transform to meet the needs of every client," explains Alicia Duncan, general manager. "Re-branding the space with its own identity allows the venue to expand into new markets, whilst utilising The Mermaid’s experience and dedicated corporate market to create awareness."